I made this last week to use up the breasts from a chicken I had roasted for the previous Sunday. I’d planned this in advance so I saved the breasts rather than slicing them and serving them up as part of the roast. The idea comes from those Alpine French dishes like Poulet Savoyard, which is usually a whole poached chicken, skinned and jointed and then gratinated in a rich wine and cheese sauce. Mine was effectively the same thing, but with the leftover breasts. I made my cheese sauce with a thin béchamel, the leftover gravy, grated Comté cheese and a tablespoon of Dijon mustard. This was napped over the chicken breasts, cut into three pieces and baked until the sauce was golden and bubbling. 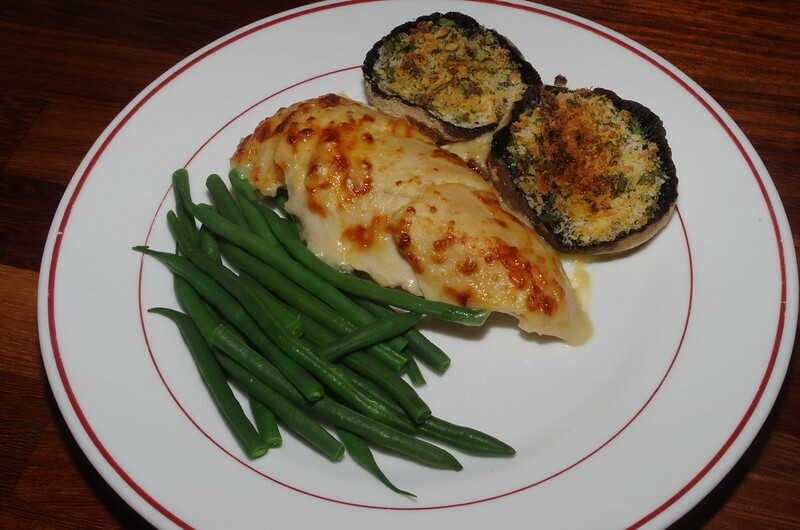 To go with this I stuffed some flat field mushrooms with butter, minced garlic, breadcrumbs and chopped parsley, seasoned with salt and pepper and baked them in the same oven as the chicken. I also cooked some green beans. Overall a nice simple tasty dish that made the most of the cooked breasts, which are not my favourite part of a roast chicken.